Nice article on Frederick County’s newest winery, Catoctin Breeze Vineyard, in the Frederick News Post. I can’t think of any other business where so many people go into the business out of sheer love for the product. Of course talking to Maryland winery owners you would be delusional if you were getting into it for the money. I look forward to sampling their wines. West Frederick Farmer’s Market re-opens Saturday May 5th for the season! Not trying to get all paparazzi on you but here is a recent picture of Chef Voltaggio at the West Frederick Farmer’s Market shopping. It’s not my picture so I’ll just link to it. This serves as a great reminder to get out there before its over! I was there two Saturdays ago and just blown away by the abundance. All the fall glory with some of summer still hanging on as well. This really is the best time of year to go. Among my scores were some amazing apples, my favorite vegetable of all time: brussels sprouts and got a huge bunch of rainbow chard on impulse. Mrs. F displayed her strong knife skills (Shout out to Chef Christine and the Kitchen Studio!) 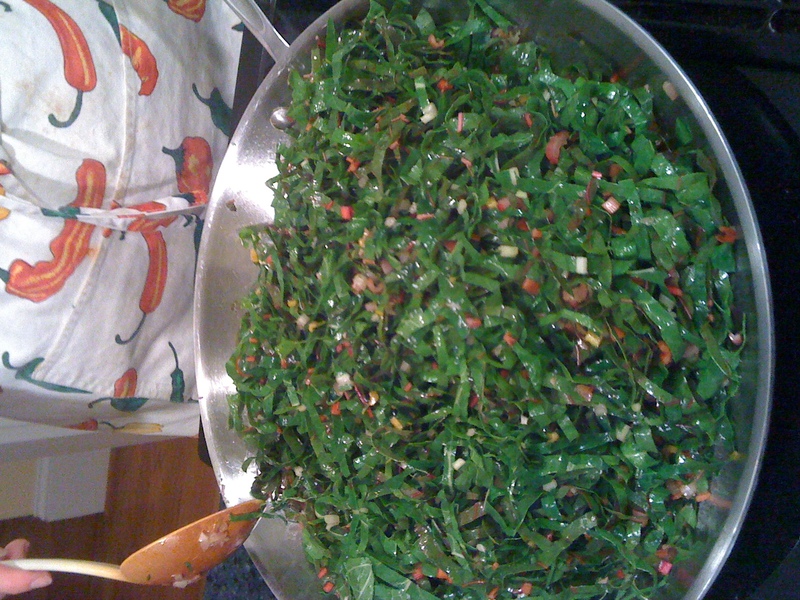 by julienning the leaves and dicing the stems. Sauteed the whole thing in olive oil and served it with a sprinkling of sea salt and a squeeze of lemon. Amazing! Reminder:- the West Frederick Farmer’s Market kicks off its 2011 season this Saturday, May 7th at 10:00 am. It is at the same location (110 Baughman’s Lane (Potomac Physicians Parking Lot), Frederick, MD 21702) as it has been in past years. It will be interesting to see what the vendors have. It seems to me that it has been a wetter and colder spring growing season so far. I know my garden is a couple of weeks behind last year. No matter what is there I am looking forward to it. It’s sort of Foodie/locavore opening day? Also due to the recent legislative change wine tastings will be allowed at Farmer’s Markets. I hope that is in the cards for the West Frederick Market. How cool would that be? According to the blog Grown In Frederick the West Frederick Farmer’s Market is staying put. There was a lot of drama at the end of last year as to whether they would remain at their long-time Baughmann’s Lane location but they have announced that they signed a contract with the property owner and they will be back. Congratulations and I’m sure they’re happy. The market opens May 1st! I must confess I’ve got Spring fever. 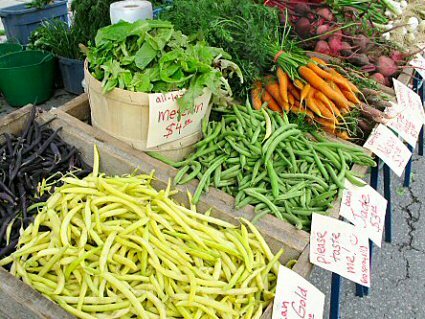 I just can’t wait to get to the Farmer’s Markets and the local produce gets up and rolling again. What’s the story on the West Frederick Farmer’s Market? Anybody know? As promised in my earlier post there is one book that I find invaluable in helping me turn farmer’s market finds into delicious food on the table. That is Vegetables from Amaranth to Zucchini: The Essential Reference by Elizabeth Schneider. This is a huge book (800+ pages!) that covers every vegetable you are likely to encounter in the United States. Do you know the difference between true (French) shallots and most of what you find in US grocery stores? I didn’t until I read that entry. Alphabetically organized it covers more than 350 vegetables. Each vegetable has its own section which goes over the history, the varieties and what to look for in selecting perfect vegetables. Beautiful color pictures illustrate throughout. Following each entry it gives a bunch of recipes using the vegetable and then finishes each section with chef’s perspectives on using the vegetable. With this book if you see something, you can buy it and take it home and be confident that you will have recipes and a strong starting point to maximize your find. You can find it here on Amazon. Not cheap but very worthwhile. I don’t blog too much about my favorite farmer’s market, the West Frederick Farmer’s Market. Not because I don’t love it, but because the blog Grown In Frederick (a long time resident of my links list), does such a good job. You should check it out. The market’s last day is next Saturday, but since I will be out-of-town I had to say my farewells this weekend. The drizzle didn’t seem to dampen the turnout. There were roughly eight or nine vendors there and they still had a great selection of apples, pears, fall vegetables, herbs and especially potatoes. Always on the lookout for something different I’m kicking myself for not buying the beautiful bunch of white carrots they had there. The line for the meats must have been 40 people long. It was sad to say goodbye, but I am already looking forward to next year. Thanks to everyone. Next: the one book you should have if you frequent farmer’s markets.